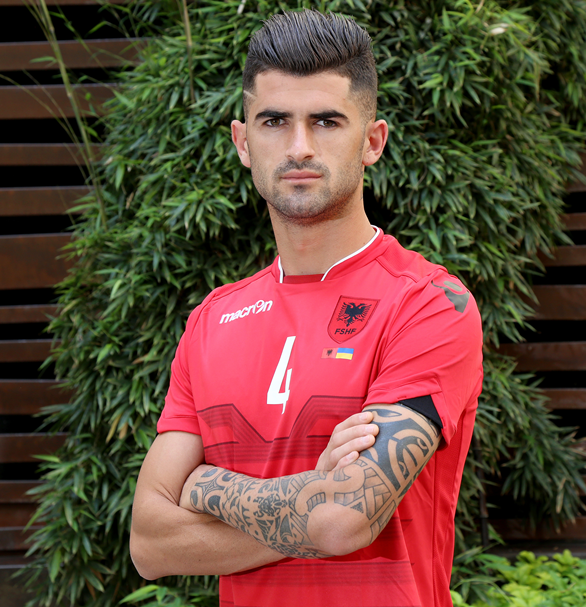 How do you feel about the Albanian National football team playing in the European Championships 2016? I couldn’t believe it that we really got there! I am only 22! It’s incredible, it’s great! I hope we will win some matches in France! It is the first participation for the Albanian Team in the European Championships. What do you think about this historic chance? You can see our feelings about this historic chance in our faces when we play. Slowly we get used tto the fact! When did you first get in touch with football? When did you start playing as a professional football player? I was 7 years old when I started playing football. At the age of 17 I understood that I want much more, that I want to be a professional. If you want to get there you need to work, to structure your life and fill your plans with passion and vitality! So I started to fulfill my dream and worked hard on the idea. Looking back, which advice would you give a young Albanian footballplayer? You have to be really professional! Never think only to have fun, don’t go out in the evening, follow seriously your plans and ideas! What are your personal expectations and goals for the Euro 2016? Football might be strage, we have to watch game after game and see! Which team is your favourite in the European Championships 2016?